The selection criteria for ambassadors should be regularized, Minister Ajith P. Perera yesterday said. Minister Perera pointed out that officers who are in the Foreign Service seem to get fewer opportunities to hold ambassoder positions, as appointments are given to persons outside the Foreign Service. Accordingly, Minister Perera requested the Foreign Minister to give more opportunities to diplomatic officers who are in the Foreign Service when deciding new appointments to the post of ambassador. “These officials who are in the Foreign Service have dedicated their whole lives for our country. They are very efficient and qualified persons who have represented our country during trying times,” Perera observed. Perera made these observations, while participating in the debate on Regulations under the Diplomatic Privileges Act in Parliament yesterday. Speaking further, Minister Perera said that taking former ambassador Jaliya Wickremesuriya as an example, he pointed out that the repercussions of appointing unqualified persons as ambassadors is extremely serious. Minister Perera also said that the present government had carried out diplomatic relations with foreign countries impressively. He said that the threat to war-heroes and political leaders being summoned before international courts, had completely disappeared owing to good international relations developed between the international arena and Sri Lanka by the present government. Janatha Vimukthi Peramuna (JVP) MP Bimal Rathnayake yesterday, told Parliament that concerns regarding the conduct of Sri Lanka’s Ambassador to Russia Dr. Dayan Jayatilleka have been raised during the recent meeting of the Committee on High Posts. Rathnayake urged that Foreign Affairs Minister investigate whether Dr. Dayan Jayatilleka has acted according to the agreement with the Ministry as an ambassador and submit a report to Parliament about such investigation. Rathnayake, while participating in the debate on Regulations under the Diplomatic Privileges Act, noted that Dr. Jayatilleka’s conduct as an Ambassador is highly questionable. “Dr. Jayatilleka may possess the right academic qualifications, but he is more like a political campaigner than a political scientist. His conduct clearly shows that,” Rathnayake pointed out. Speaking further, Rathnayake said, “When his name was brought up before the Committee on High Posts, questions were raised whether it was correct to appoint a person such as him as an Ambassador. Rathnayake added that, following the Committee’s lengthy discussions, Speaker Karu Jayasuriya advised Dr. Jayatilleka to stick with on to the agreement with the Foreign Affairs Ministry before approving his name as Sri Lanka’s Ambassador to Russia. However, Dr. Jayatilleka still carries out his political campaigns despite such advises, Rathnayake observed. “When the Constitutional coup on October 26, 2016 took place, Dr. Jayatilleka supported and campaigned for it. We saw that he campaigned for the coup more than some of the MPs in this House. A diplomat cannot behave in that attitude. This is a violation of Parliamentary privileges. The Committee on High Posts during its recent meeting, discussed about this,” he added. The JVP yesterday, urged the Government to review Sri Lanka’s agreement with the International Water Management Institute(IWMI), as some of the provisions of that agreement were against national interests. The International Water Management Institute is a non-profit research organization. JVP MP Bimal Ratnayake participating in the debate on Regulations under the Diplomatic Privileges Act, pointed out that Sri Lanka had entered into an agreement with IWMI in 1984 and the Research Institute had been given powers to export genes from Sri Lanka. “The Government has published a Gazette with a list of names of institutes and organizations to provide them with diplomatic privileges. This is a serious issue, as those organizations are to get privileges hitherto enjoyed by Embassies and High Commissions such as the Indian and British High Commission and the Chinese Embassy in Sri Lanka. When you consider the track records of such organizations for the past 20-30 years, we find that there are differences of their stated mission and actual practices. IWMI has powers to import and export gene resources in and out of Sri Lanka. Even the Department of Agriculture does not have such powers. The IWMI has been given powers to sell the water of this country. I am not talking of selling bottles of drinking water, but of water rights. The IWMI has been given that mandate. We have discussed this matter in the Sectoral Oversight Committee. The Government should not sign agreements blindly,” Ratnayake pointed out. The Foreign Ministry should reconsider whether such organisations listed in the Gazette be provided with diplomatic privileges, Ratnayake said. “We should strengthen the strategic and legal departments of the ministry, or else, the country would enter into agreements with foreign powers blindly. That would be detrimental to national interests,” Ratnayake pointed out. Meanwhile, concluding his speech JVP MP Bimal Ratnayake held the Ministry of Science and Technology and a “circle of the Black Media” responsible, for promoting con-artists such as Keerthi Dissanayake, who was recently arrested for selling people fake “Valampuri” Conches. Ratnayake pointed out that he himself raised concerns in regard to the said person at two Budget debates. “I personally spoke of this person and his fake conduct with the Minister of Science and Technology. The Government should be held responsible for allowing such persons to thrive, fooling the innocent people,” he added. Speaking further, Ratnayake held certain media channels responsible for promoting persons similar to those arrested. “These media channels received money from this man who sells ‘snails’ to people when promoting him. They used a people-owned frequency to spread lies,” he said. UNP-MP Mujibur Rahuman urged President Maithripala Sirisena to hold Presidential elections as soon as possible prior to the General election. He noted that there is no internal crisis within the UNP, while they understand where they stand. “The issue here is with the executive. If we hold a Presidential election, we could then find out which side has the power. Even if we go for a General election and win, we still would have to work with the current President. But we cannot work with him as he is preventing us from working by obstructing our path. Hence, what is more important is to hold the Presidential election. Therefore, we urge the President that came into power by riding on our backs, to hold a Presidential election first,” he said. Responding to allegations that foreign ambassadors were seen clapping in Parliament during the recent clashes, Rahuman said, adding that foreign Ambassadors were not invited by them but they witnessed the havoc that was caused in Parliament by some MPs. “lapping is not the issue but the behaviour of these MPs that brought shame on the country. We are unable to walk on roads. Hence these MPs need to be taught to behave, especially in front of foreigners, as it reflects badly on the country. They must have felt that they were in a zoo. We should be ashamed of how these MPs behaved in Parliament that day. It is irrelevant which party we belonged to, we must know how to conduct ourselves in a manner that would not tarnish the image of the country,” he noted. The ‘Chair Panel’ for the 3rd Session of the Eighth Parliament, which comprises of members to preside in the absence of the Speaker, was informed to Parliament yesterday. The ‘Chair Panel’ is appointed by Speaker Karu Jayasuriya, while the list of names was read out by Deputy Speaker Ananda Kumarasiri. 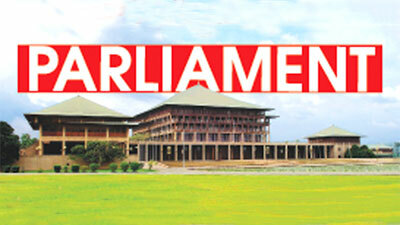 The 11 member Chair Panel include MPs Sriyani Wijewickrama, Bimal Ratnayake, Anura Sidney Jayarathne, K. Thurairetnasingam, Janaka Wakkumbura, Velu Kumar, Mayantha Dissanayake, Tharaka Balasuriya, Mujibar Rahuman, Harsha Rajakaruna, Thusitha Wijemanna, Hesha Withanage and Wijepala Hettiarachchi.